It is now nearly three months since I received your kind letter. Annie is very much pleased with her Valentine, she also received one from her cousin Eleanor and I do not remember if she answered her letter or not. I would have written sooner but I have had no servant for nearly four months so I am kept busy. These were the first lines of a letter written by Limerick woman Eleanor McGhie, on 21 May 1873, to her niece Mary Mossop, in Philadelphia. The letter she wrote used both sides of one sheet of paper, having filled the second side she turned to the first page again, rotating it by ninety degree and writing over the initial writing. 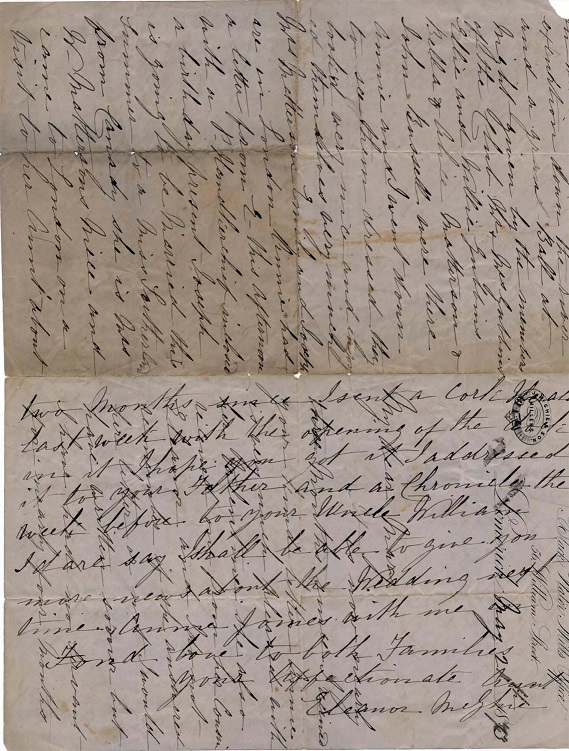 This method of writing was known as ‘cross writing’ and was common practice during the Victorian era when postage was still charged by the page and writing paper was expensive. Occasionally letters were even re-crossed, which entailed writing the third and fourth pages in the crossed style and then returning to pages one/three, turning it forty-five degrees and cross writing once more. In this fashion six pages could be written onto one sheet, although in many cases this would render the letter almost illegible. Eleanor McGhie’s letter which was a folded sheet filled three pages in straight writing and one in crossed it was still quite clear and concise. 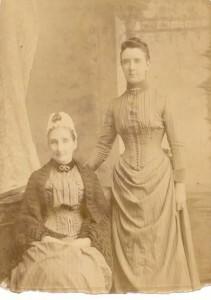 Eleanor McGhie and her daughter Annie. Along with the trivial information on family members well being this letter also gave an all too brief glance into the life of a Limerick woman in the 1870s. Eleanor Mossop McGhie was born on 23 October 1823 in Cumbria, England. Her two aunts Mary and Eleanor Mossop married Joseph Matterson and John Russell respectively. These men arrived in 1816 to establish the Matterson’s bacon factory. Soon after in the 1830s the three surviving Mossop brothers, which included Eleanor’s father John, joined their sisters in Limerick. Eleanor married James McGhie who was a miller and whose family ran the Blackwater mills, whose offices were based at 56 William Street, the address from which Eleanor’s letter was posted. She had one child, a daughter, Ann McGhie born 19 May 1862 in Limerick. By 1877, James McGhie had passed away and Eleanor was living at 31 Henry Street. 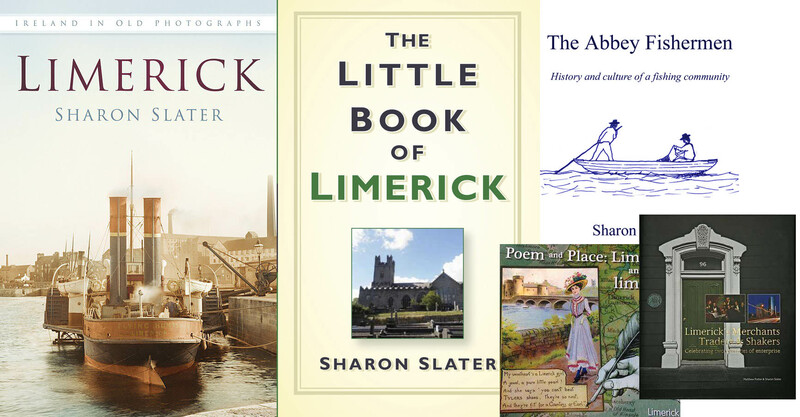 Being married to a miller she was considered a station below her Matterson and Russell relatives and although she would have been privy to many of the social events in Limerick she would not have received an invitation. In her letter she refers to the recent visit of the Lord Lieutenant of Ireland, John Poyntz Spenser, the third earl of Spenser, to Limerick to open a new gravel dock. On arriving in Limerick at one thirty in the afternoon of Tuesday the 13 May 1873 the Lord Lieutenant took luncheon at the residence of James Spaight on Georges Street. At three o’clock he arrived at the dock which was officially opened with a speech by the Harbour Commissioner. The Lord Lieutenant rose to make his speech but was interrupted by the jeers of a large crowd which had gathered to demand the release of political prisoners, and the return of Jeremiah O’Donovan Rossa. O’Donovan Rossa the founder of the Phoenix Society which would later be incorporated into the IRB was exiled from Ireland and travelled to New York in 1871. This riot would go no further than a vocal display as the ceremony had also been attended by the 64th Artillery Battalion and a troop of Lancers. The remaining ceremony ran smoothly and without incident. Following the ceremony the Lord and his wife were lead to the Model School where they were welcomed into the boys’ room with a rendition of ‘God save the Queen’. They then proceeded to the girls room where two copy books, including that of Eleanor McGhie’s eleven year old daughter Annie, were inspected and duly complemented upon, the Countess stating that ‘they were very nicely written’. Following other spectacles and displays Annie McGhie and two of her class mate were once again called upon this time to recite ‘Lady Clare’. ‘Lady Clare’, a poem written by Alfred Lord Tennyson who was poet laureate at the time, making this piece quite contemporary. On the Wednesday a ball was held in honour of the Lord Lieutenant at the Limerick Country Club. Eleanor and Annie McGhie although not in attendance enjoyed much of the mood and revelry as their relations, the Matterson Russell and Gubbins families, prepared for the evening. The ball would last until two the following morning, after which the Lord Lieutenant rose at nine that day and made the short journey to fish at Doonass before returning to Dublin, later that day, by train from Castleconnell station. Mrs. Matterson, Emily and Joseph are in London. Annie had a letter from E- this afternoon with a P-handkerchief enclosed, a birthday present. Joseph is going to be married this summer to a Miss Sutherland from Canady, She is Mrs. W Matterson’s niece and came to London on a visit to her aunt about two months since. I sent a Cork Herald last week with the opening of the dock in it, I hope you get it. I addressed it to your father and a Chronicle the week before to your uncle William. I dare say I shall be able to give you more new about the wedding next time. Annie joins me in fond love to both families. 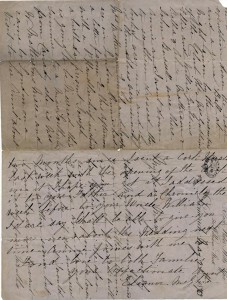 Eleanor McGhie letter, 21 May 1873, courtesy of Pat Mossop, Philadelphia. Correspondence with Pat Mossop, 28 March 2006, 14 August 2006. Mossop family headstone, St. Munchins graveyard, Limerick. Cork Examiner, 16 May 1873, 17 May 1873. Bassett Trade Directory, Limerick, 1877, p. 52. Bassett Trade Directory, Limerick, 1880, p. 56. The Encyclopaedia of Ireland, ed. Brian Lalor, p. 813.